FOURTEEN YEARS AGO a handful of enthusiastic American sign-makers saw an opportunity in Australia. Aussies were investing heavily in tourism, but had very few local sources for hand-carved dimensional signage - just the kind of signs tourists love! Starting in a rural wool shed with a few hand tools, Danthonia Designs was born! Locals may have wondered what the 'Yanks' were up to . . . but thousands of signs and dozens of awards later, we have made our mark Down Under and the hand-crafted sign vision continues to grow. Our markets spread quickly from tourism to schools, home owners, wineries, farm and property owners, aged-care, healthcare, retail, churches, food and hospitality venues, architects, developers and local governments. 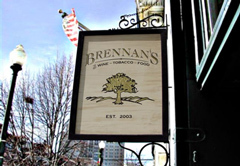 Our products expanded from small wall signs to large pylon signs and monuments. Anyone wishing to make a 'quality statement' found that handcrafted dimensional signs were a great way to do it. Today Danthonia's 40 plus designers, artists and artisans use office and work areas of over 60,000 sq/ft to create signage of all sizes for clients across Australia and internationally. In addition to our Aussie market - we ship between 100-200 signs per month to the USA. Although we've introduced hand-carved signage to Australia, we're also honoured by the number of clients who continue to contact us from back home. The Aussie dollar is lower than the US dollar and Australia / United States have a free trade agreement - this means US clients get good value for money. 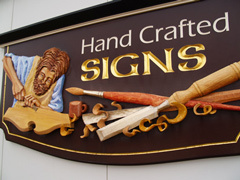 Our on-line sign-designer tools allow you to customize your own sign. Try out different colors, change the artwork or a font, and order when it looks just right for you! Although each Danthonia sign is individually handcrafted, we have developed a team approach that allows a 21 day delivery for most US orders. For a rush fee we can deliver in 15 days. 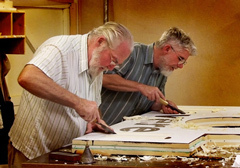 Give us a try - we would love to carve you a sign!